MEXICO CITY -- Mexican prosecutors said Saturday they are searching for a gunman who opened fire on an official of the U.S. Consulate in the western city of Guadalajara. The Attorney General’s Office said Saturday the official was wounded in the attack Friday in Guadalajara -- and the U.S. Consulate said on its Facebook and Twitter pages that the FBI was offering a $20,000 reward for information on the attacker. Guadalajara is the capital of Jalisco state, which is dominated by the hyper-violent Jalisco New Generation cartel. There was no immediate evidence of any cartel link to the attack. 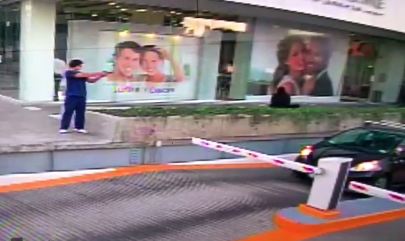 Surveillance video of the attack shows the gunman following the official in a parking garage. The official, whose name was not released, was dressed in shorts. The shooting appeared to be a direct attempt to kill the consular employee. In the video, the attacker doesn’t appear to try to approach the official while he is walking, but instead waits for him to exit the parking garage in his vehicle and fires a round into the car’s windshield. The U.S. Consulate posted several clips of CCTV video related to the incident on its Facebook page. Guadalajara is Mexico’s second largest city and is not specifically singled out for any special precautions in the latest U.S. travel warning updated on Dec. 8. The U.S. Embassy in Mexico City said that for privacy reasons no further information would be made available on the victim, including his condition. The Attorney General’s Office said the victim was in “stable” condition and under protection, apparently at a local hospital. The office said the case was being handled by federal detectives. An attack on diplomatic personnel would be considered a federal crime in Mexico. U.S. consular employees and other U.S. agents have been attacked in Mexico in the past; the attackers have usually argued the attacks were cases of mistaken identity. In 2014, a Mexican gang leader was sentenced to life in prison for his role in the 2010 slayings in the border city of Ciudad Juarez, Mexico, of a U.S. Consulate employee, her husband and the husband of another employee. Prosecutors said Arturo Gallegos Castrellon was in charge of a team of assassins with the Barrio Azteca, a gang allied with the Juarez drug cartel, and had ordered the three slayings. The killings of U.S. Consulate employee Leslie Ann Enriquez Catton, her husband, Arthur Redfels, and Alberto Salcido Ceniceros, the husband of another consulate employee, as they left a children’s birthday party were a mistake, former gang members testified during the trial. Redfels was driving a white SUV that was very similar to a vehicle that Gallegos Castrellon had marked as a target for his team of assassins because they thought it belonged to members of the rival Sinaloa cartel. In 2012, uniformed police pumped 152 bullets into a U.S. Embassy vehicle carrying two CIA officers and a Mexican navy captain. The police officers, who wounded the Americans and face attempted murder charges, initially said the people they attacked were in uniform and marked cars, and that they had responded to fire from the SUV. But details of the attorney general’s investigation said those attacked were in street clothes, riding in unmarked vehicles (including two of their personal cars) and under order at all times from their commanding officers. A Mexican drug cartel lieutenant pleaded guilty in 2013 to murder and attempted murder of an officer or employee of the United States in the Feb. 15, 2011, shootings of the U.S. Immigration and Customs Enforcement agents. The attackers acknowledged they were members of a Los Zetas Cartel hit squad and directly participated in the attack, which resulted in the death of ICE agent Jaime Zapata and the wounding of his colleague Victor Avila, both based in Texas. According to court documents, a commander in Los Zetas Cartel tried to hijack the agents’ armored government vehicle as it was driving on Highway 57 in San Luis Potosi. After hit squads forced the vehicle off the road and surrounded it, the Zetas commander ordered the U.S. agents to get out. The agents refused and tried to identify themselves in Spanish as diplomats from the American Embassy, but the hit squad members fired into the vehicle, striking both of them.